Hi All! I’m so excited to be here and have the opportunity to introduce myself and my blog! My name is Elizabeth; you can find me over at To Be Charmed. As a web/graphic designer and mom of two I needed an outlet, a place to share ideas and gain inspiration from one another. 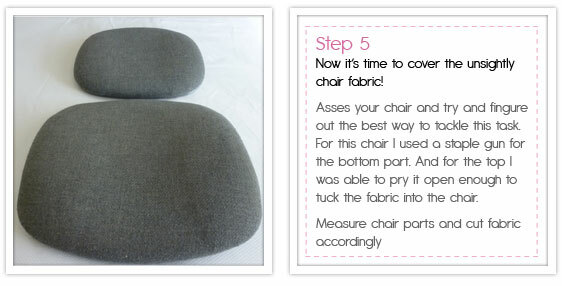 Today we will be reupholstering an unsightly office chair! How many of you have one of these floating around your house?! Well, I’m in the process of turning part of my garage (yes garage! only some in California would be doing this!) into a craft room and couldn’t bare the possibility of having to use this office chair in my newly (well we aren’t quite done with it!) decorated craft room. Are you ready? Grab your tools and let’s get to work! The beauty of this project is I only spent $26.42 on it. I got my fabric over at QuiltHome.com. They have a huge selection of fabrics and if you sign up for their newsletter your sure to catch a sale. Thanks for allowing me to share this project with you! If you would like to see more tutorials like this, you can always come on over to my blog, To Be Charmed. Hmmmm, I am thinking that would look awesome in my office!! Great idea!! How fun! 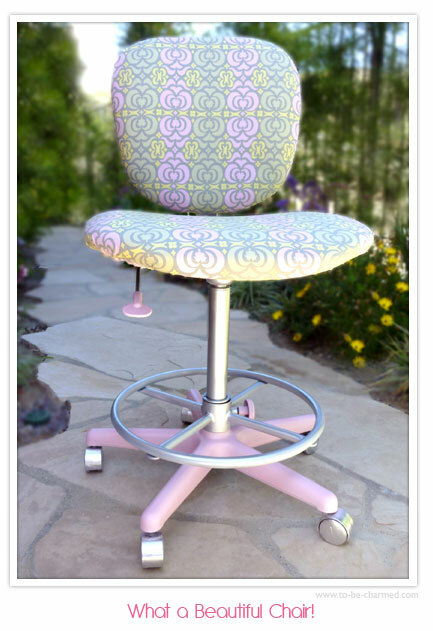 I stayed up until 2 in the morning working on refacing an office chair. Great minds think alike! Ok, you had me at “hello” – this is one of my most favorite projects I’ve seen lately. We are re-doing my sewing room right now – I feel like I need to head to the thrift store right now to do this project!! ooh, I like it! I’ll have to do this for sure! It would be great for a kids room/study room too. That has to be the cutest project I’ve seen in a while. Can’t wait to try it. Thanks for sharing. Her link isn’t working when I click from anywhere on the post for some reason. This is AMAZING! Thanks for sharing!! 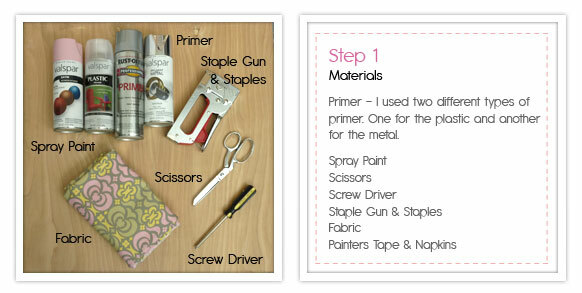 I will definitely have to keep this in mind for a craft room someday!!! I recovered an office chair about 15 yr ago. 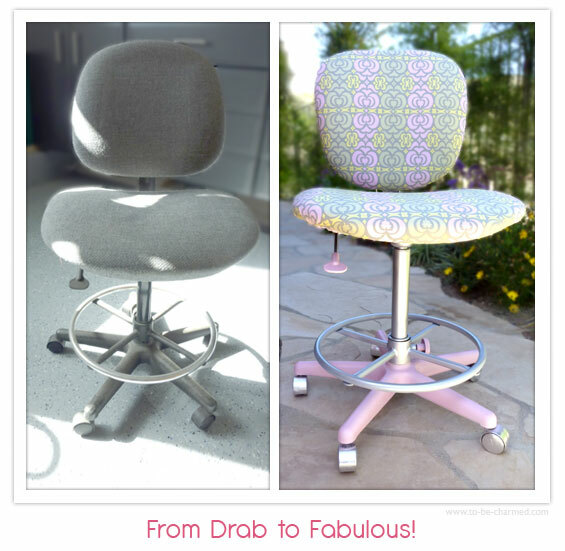 Love how much easier ‘current’ office chairs are to make ’em Za-za like yours is! I love all your great ideas. 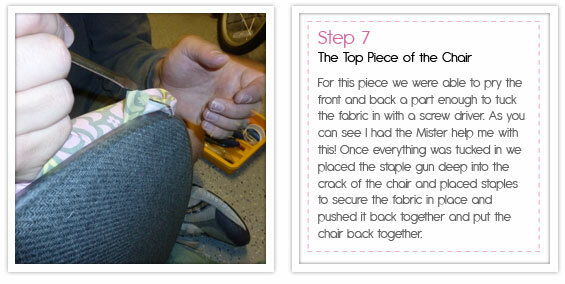 love this and bookmarked it months ago, and finally just covered my office chair in cornflower blue corduroy. so much easier that i thought it would be, and it is just perfect!